The First Annual Santa Cruz American Music Festival is set to rock Aptos Village Park on Memorial Day Weekend 2015, Saturday and Sunday, May 23-24. This year’s headline acts are Bonnie Raitt and Big & Rich, with a number of other highly talented artists including J.J. Grey, Los Lonely Boys, Coco Montoya, and many more. Tickets go on sale starting March 1: children 6 and under are free, kids 7-12 are $25, and adults are $65 each, or $120 for both days, and can be purchased directly on the festival’s web site, or at Street Light Records in Santa Cruz. While this is the First Annual Santa Cruz American Music Festival, the event is really the successor to the Santa Cruz Blues Festival, which was held in Aptos Village Park every year from 1993 to 2014. Aptos Village Park has historically hosted a number of festivals over the years, including the KPIG Fat Fry, the California Beer Festival, Santa Cruz Mountain Bike Festival, and many others. Get ready for Gourmet Grazing on the Green on Saturday, September 27 from 12:00 to 4:00 PM at Aptos Village Park! This event is in its 11th season, and it’s a fantastic day of excellent wine, delicious food and, of course, live music! While away the day savoring the rich flavors from dozens of the most acclaimed local restaurants and wineries. This event is put on by the Santa Cruz Cancer Benefit Group, and all proceeds from the event go to support the cause. Tickets for the event can be purchased here. 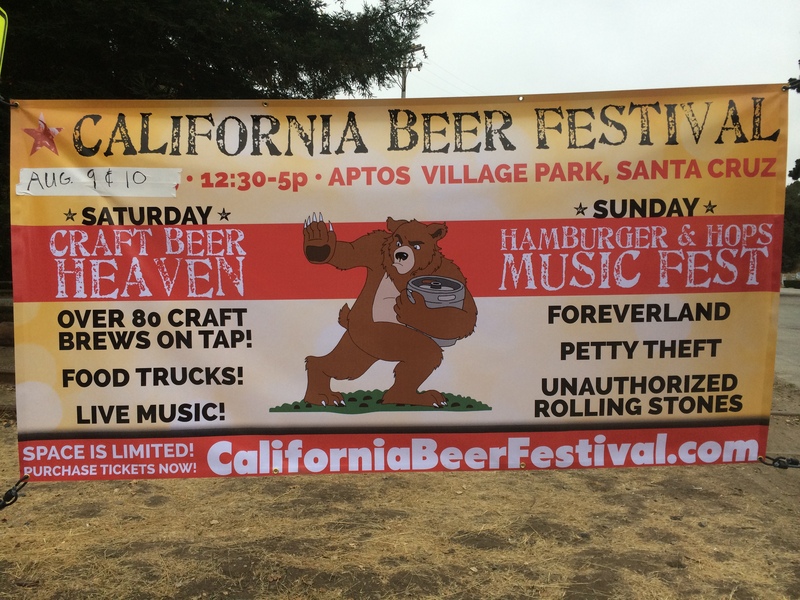 The 4th Annual California Beer Festival is coming to Aptos Village Park, Saturday and Sunday, August 9th and 10th 2014 from 12:30 to 5:00 PM. On Saturday, craft beers will be featured with Craft Beer Heaven with over 85 craft beers on tap (free samples available! ), live music, and a variety of foods available. On Sunday, festival goers will enjoy “Hamburger & Hops Music Festival”, featuring music from a number of tribute bands: “Unauthorized Rolling Stones”, “Petty Theft” San Francisco Tribute to Tom Petty and the Heartbreakers and “Foreverland”, a 14-Piece Tribute To Michael Jackson. Proceeds will benefit the Gen Giammanco Foundation, a non-profit organization that provides financial support to student athletes to assist in their pursuit of both scholastic and athletic success in Santa Cruz County. Should be a great day out in Aptos Village Park! Tickets are on-sale now, with a variety of ticket options, including a $70 two-day VIP pass. You can buy tickets on-line, and also from Whole Foods in Santa Cruz and Capitola. Aptos Village Park is a hidden gem in the Santa Cruz county parks system. Unless you know it’s there, you’ll never see it, as it is tucked down below the road. It comprises 10 acres, with a very expansive, sunny flat meadow taking up much of the room. There’s no playground here, but there are BBQ pits, a picnic area, and the park does stretch along Aptos Creek for a few hundred yards, and that’s a great place for kids to explore. There’s also a community hall, where the Cabrillo Host Lions Club meets, which can also be hired out for special occasions. 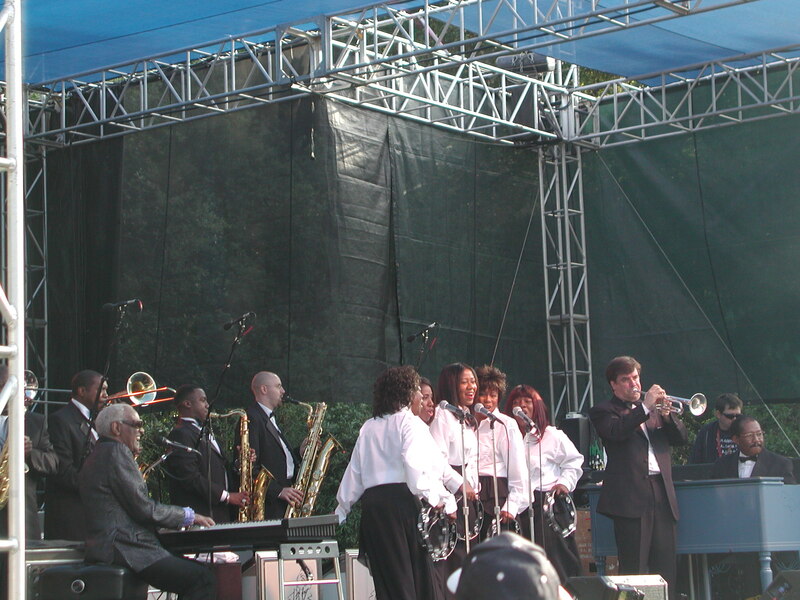 The park is typically used to host weddings and other special events, like the yearly Santa Cruz Blues Festival. It’s Memorial Day Weekend in Aptos, which for the last twenty plus years has meant it’s also the weekend of the Santa Cruz Blues Festival, held down at Aptos Village Park. I haven’t been to the blues festival in years – the last time I went was to see the great Ray Charles play what turned out to be one of his last concerts. Aptos Village Park is an awesome venue for a intimate outdoor concert experience such as the Blues Festival. For a number of years, they also held the KPIG Fat Fry there, too, although it’s been many years since the last one. The Blues Festival spans two days – on Saturday, Gregg Allman headlined, and I heard from one of the ticket vendors that it was a great show. We went on Sunday, when Chris Isaak headlined. The crowd was a little thin – didn’t look anywhere close to sold out to me, although there were thousands of people there. I guess last year (2013) was kind of a disaster, oversold and with ham-fisted security people, so maybe that had something to do with the light attendance. I went this year because Jackie Greene was playing, and I’m something of fan. I first saw him play 7 years ago when he joined Phil Lesh and Friends at the ripe of age 26. I was pretty impressed when I saw him jam with Phil and Friends – there’s no question, he plays a mean guitar, harmonica, and keyboard. I haven’t seen him play since then, but I’ve bought a number of his albums and caught him on YouTube here and there. I went to the blues festival this year with my wife Rocio, our children Aiden (5) and Evan (2), and also my wife’s cousin Andrea who has been staying with us as she studies at Cabrillo College. Andrea had never been to anything like the Blues Festival, although Rocio did go with me to the Phil and Friends show back in ’07. We all had a really good time – Rocio and Andrea particularly enjoyed Vintage Trouble. They were a lot of fun, a very tight blues band with great energy. Chris Isaak took the stage around 5 o’clock or so, and he was a lot of fun too – but we probably only made it half way through his set. We wanted to avoid the mad dash for the bus which would take us back to our car we’d parked at Cabrillo College. It worked out beautifully, actually – the bus was right there waiting for us when we walked up the hill out of the park. The lineup for the 22nd annual Santa Cruz Blues Festival has been announced – and as usual, it brings an amazing amount of talent to our little town! This year, the festival is being headlined by Gregg Allman (of Allman Brothers fame) and Chris Isaak. The Sunday show also features musical virtuoso Jackie Greene, a rising star on the Jam Band circuit and an absolutely phenomenal talent at guitar, harmonica, and keyboard. Jackie is a son of the Monterey Bay area, having been born and raised in Salinas. The festival dates are May 24th and 25th, and tickets are available on-line through the web site, but can also be purchased at Moe’s Alley and Streelight Records. The Santa Cruz Blues Festival is one of those yearly events that make Aptos truly special. Plan to come early and stay late – they serve a wide range of food and beer. Bring the family and a set of lawn chairs and prepared to be amazed. Also, be sure to like them on Facebook.